Our range of liqueurs consists of 9 different flavours, each one made with the highest quality varieties of fruit and natural ingredients. Two different types of cinnamon are used in the production of this liqueur. 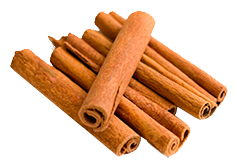 Chinese cinnamon, which is very aromatic, and Sri Lankan cinnamon, which has a slightly spicier note, are macerated and distilled in traditional copper pot stills. A maceration of red fruits and orange blossom is added to the final product to give a fresh, exotic touch which enhances its flavour and gives the liqueur a spectacular shade of pink. A fantasy of colour and flavour where all the aromas blend harmoniously and the alcohol is beautifully integrated. Notably sweet but very pleasing on the palate, a very versatile liqueur for cocktails. Serve chilled or mixed with milk or fruit juice.